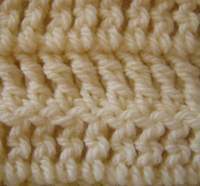 Treble crochet is one step longer than double crochet, but it is worked in the same way. You would often use it as a "crossover" stitch when working with cables, and equally you can work it into lace and in combination with other basic stitches to form more complex designs. Think back to double crochet...there you needed 3 chains to bring the row up to the height of the stitch, well with treble crochet you'll need 4 chains to equal the height of one stitch. Remember learning double crochet? Well - the principles are exactly the same, you just need to do an extra yarn over before you start. You have already worked your chains, plus the extras for the height of the row (as above), now yarn over twice, then push your hook into the 5th chain from the hook, yarn over and bring your hook back through to the front of your work (4 loops on hook), yarn over and pull through 2 loops only (3 loops on hook), yarn over and pull through 2 loops only (2 loops on hook), yarn over again and pull through last 2 loops (1 loop on hook) - Yessssss - stitch complete! See - I told you it was easy. You should always have 3 loops on your hook BEFORE you push your hook into the next stitch. You will always pull your hook through 3 sets of 2 loops. What could be easier? No, I'm not going to do it for you, but if you need extra help, check out these pictures at the bottom of the page. Don't forget, you typically need 4 chains to equal the height of one treble crochet. After working your turning chains, always work into the next stitch unless the pattern indicates otherwise. The 4 turning chains usually are counted as one treble stitch for pattern design purposes. You're almost ready to start crocheting purses...just a couple more stitches you'll need, like slip stitch for example and half double crochet, then you'll be ready for some patterns. Bet you can't wait!